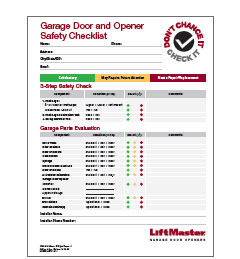 Residential Products | Overhead Garage Doors by Doorways, Inc.
1 in 15 garages may lack the latest safety features or may not be operating properly. Do our easy 3-Step Safety Check to ensure it is rock solid, and your family is protected. Lay an object that is at least 1.5 inches higher on the ground in the door’s path, and press the close button. The door should reverse off this object. Have this inspection performed by one of our trained service technicians. At a reduced service rate a technician will inspect all of your garage door and opener components, lubricate the system and make minor adjustments as needed. After the inspection you will receive a checklist detailing the condition of your door and opener system along with any suggestions the technician may have to make your door safer and more reliable. Contact our office to schedule an appointment and be sure to mention the “Don’t Chance It. Check It.” program to receive the reduced rate. Keep tools, chemicals and sharp objects in locked cabinets and always out of the reach of children. Consider installing shelving or cabinets; then label each. You’ll quickly find what you’re looking for while protecting the items and keeping them safely away from children. Certain common household chemicals can just ignite by coming in contact with one another. Be sure to read warning labels and expiration dates, and store each securely in its own location. Prevent carbon monoxide buildup in your garage by making sure to have a door open when running your car or using any portable, fuel burning heaters indoors.